Every election cycle, I get various fundraising letters from both political parties. I always understood why I received them from Republican candidates. 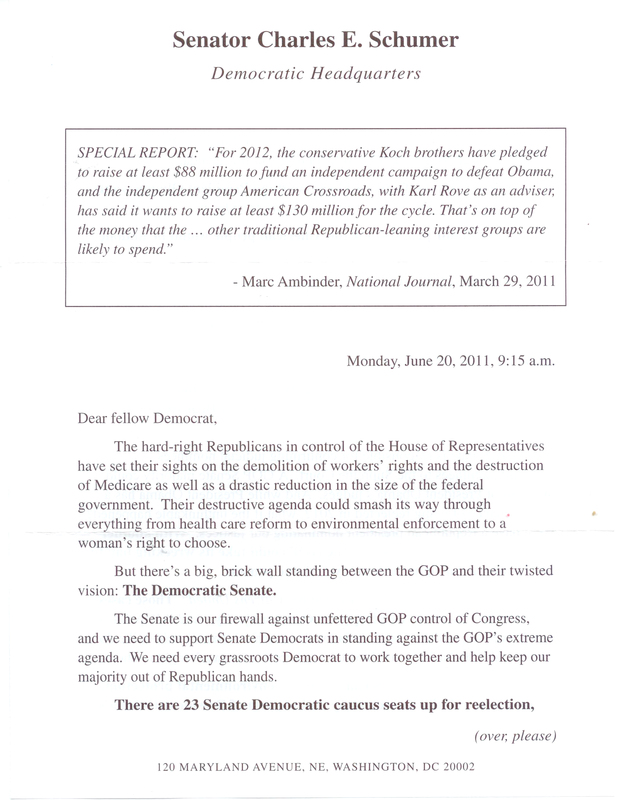 However, for some strange reason, I also receive these letters from the Democratic Party as well. Last week, I received one such letter from Senator Charles Schumer, and it was hilarious. And I thought the extreme right was crazy. You have to admit, the hyperbole is quite entertaining. This entry was posted in California, Climate Change, Education, Finance and Economics, Healthcare, Media, Policy, Politics, Social Security, Taxes, Unions and tagged Democrats, Fahrenheit 451, Fundraising, Republicans, Senator Chuck Schumer. Bookmark the permalink. I’ve subscribed to the New Republic, Reason and Weekly standard. I get a lot of GOP and Democratic solicitation as a result I think. I subscribe to The Economist, Foreign Policy, and Foreign Affairs. Maybe these solicitations are related to those magazines then.